Heinz Krügel was born in the small village of Ober-Planitz, near Zwickau on 24th April 1921 in what would be – between the end of the Second World War and the reunification of the German state – East Germany. Even as a young boy, football was a major part of his life and at the age of six, he was playing for the local club, SC Planitz, He stayed with the club for the next 23 years, and in 1948, he had his first taste of national success when Planitz won the inaugural Deutscher Sportausschuss Oberliga (the East German league championship). Less than two years later, Heinz Krügel’s playing career was ended by a serious knee injury. It was that misfortune however, that ultimately led to a more celebrated career, as Krügel turned his hand to coaching and management. It would also have the unfortunate consequence of bringing him into conflict with the government authorities. Retirement was no time for self-doubt, and the following year, Krügel became the Oberliga’s youngest manager when he took over at the army sports club, KVP Vorwärts Leipzig. He stayed with the club for two years, but this was the time when the Cold War was very much warming up, and the East German authorities saw sport as just another tool to be used in the furtherance of the state’s ambitions. The club was uprooted from Leipzig and moved to East Berlin, being rechristened as ZSK Vorwärts Berlin. Krügel also moved on, not to Berlin with Vorwärts though. Instead, he took charge of another club in Leipzig, BSG Einheit Ost. The whole episode was a harsh introduction to the realities of sporting life in East Germany, and a harbinger of how the state would take a continuing and increasingly destructive role in Heinz Krügel’s managerial career. Much as with the re-siting of his KVP Vorwärts employers, the dissolving and reincarnation of football clubs in East Germany was a fairly fluid process, and the year after taking control of BSG Einheit Ost, it was merged with SC Rotation Leipzig. Years, later, it would evolve into FC Lokomotive Leipzig and become one of the major clubs in the country. Krügel’s stay there would not be long however, and by 1956 he had left, to be replaced by Werner Welzel. His success had led to a move to SC Empor Rostock, who had finished the previous season as runners-up in both the league and cup. It was an opportunity to move the club into a position of winning honours. In his first season however, there things didn’t go well. The club slumped to fourteenth position in the league and were relegated. In 1958 however, he oversaw a return to the top flight, at least restoring the status of the club back to where it he had found it. Promotion was something Heinz Krügel would achieve a number of times as his career progressed. He would leave Rostock the following year for a more elevated post. His work in setting the club on a path of success was picked up by his replacement, Walter Fritzch who, during the next half dozen seasons took the club to three runners-up spots in the league as well appearances in the several cup finals. In 1959 Krügel was given control of the East German national side. It was, however, a fallow time for the team. The political control exerted by the state had strangled much of the potential player development, in favour of collectivist organisation and reorganisation of both club structure and state-approved coaching methods and Krügel’s stay in charge was short, lasting a mere eight games. In the competitive fixtures where he led the team – qualifiers for the World Cup and European Championships – East Germany were defeated in all but one. That single half-success being a 1-1 draw with The Netherlands in Leipzig when a late goal by Dieter Erler earned the single point his team secured in seeking qualification for the 1962 World Cup. Suffice to say they finished bottom of the three-team group. In a strange footnote, the return fixture, due to be played in Holland, was cancelled. There were problems with some of the East German players being granted visas to enter the country and, as results ahead of the game had placed Hungary in an unassailable position for qualification, the fixture for the ‘dead’ match was abandoned. Hardly covered in glory, it was no surprise when, in 1961, Krügel left the national team to take over control at Hallescher FC Chemie. The return to club football seemed to reinvigorate the manager and immediately brought results, with the club winning the East German Cup the following year. Despite having five years in Halle – the longest of stays at any club in his managerial career thus far – notwithstanding the cup victory, it still wasn’t a glowing success. Relegation and then the required promotion occurred and in 1966, he left to manage 1. FC Magdeburg, taking over from Günter Weitkuhn. It was here that he found what appeared to be the natural home for his managerial talents. In the following years, he not only delivered outstanding success, but also developed a number of players for the national side, providing much more benefit to the success of the country’s team on the international stage, than he had whilst managing it. From 1969 to 1974, Magdeburg produced no less than nine full internationals, three of whom played in the ‘fraternal triumph’ over West Germany at the 1974 World Cup. With the inherent political advantages that the victory brought to the East German regime, some may have assumed that there would be a measure of gratitude for the efforts of Krügel in developing players for the national team. Ironically however, when his fall came, it would be a stated failure to do precisely that thing, that would be cited as the reason for his removal. Der Club, as Magdeburg were known had just suffered relegation when Krügel arrived. His brief was for an early return to the top league, and having already achieved promotion with both Rostock and Halle, it was one he was confident of delivering on. Wasting little time in rebuilding the squad and introducing his coaching methods, he duly achieved promotion at the first time of asking. That, however, that was merely the prelude of what was to follow. Under Krügel, Magdeburg would go on capture three East German championships – in 1972, 1974 and 1975, and finished in third place in 1968, 1969, 1973 and 1976. They also won the East German cup in 1969 and 1973. The crowning glory for Krügel and his squad came in 1974 though, when Magdeburg became the first and only East German club to lift a major European trophy defeating the aristocrats of AC Milan 2-0 in Rotterdam in a game where Heinz Krügel’s tactics, seemed to perplex the efforts of Giovanni Trapattoni, then in caretaker charge of the Rossoneri. 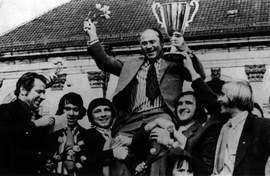 To no-one’s great surprise, the news of Krügel’s success spread quickly – especially in Italy where the general consensus had been that Milan would retain their trophy with some comfort against the unknown East German club. Rumours grew that some of the continent’s biggest clubs were interested in taking him over the Berlin Wall and into the more lucrative world of football in the west. A certain Old Lady in Turin was thought to be so smitten with Herr Krügel that they were reported to have offered four million marks as an incentive for him to take over at Juve, providing he brought Martin Hoffmann, one of Magdeburg’s brightest lights with him. Whether for reasons of political expediency or loyalty to Der Club however, Krügel declined the offers. Magdeburg lies just 25 miles from where the border with West Germany used to lie, but it was a distance Heinz Krügel found too far to cross. Whatever the reasons for the decision however, it may well have been one he came to regret – always assuming, that is of course, that it was his decision, rather than one imposed under governmental pressure. If the latter had been the case, any governmental pressure to prevent a defection to the west may have been more to do with denying his services to the west, than to keep a favoured son within their remit. Whilst sporting success was always seen by the political authorities as reflecting well on the Socialist state, the sort of individualism and personal acclaim that Krügel developed and received, fitted ill with the collectivist tenets that the Sozialistische Einheitspartei Deutschlands (Socialist Unity Party of Germany) proclaimed. A hero to many, especially the Magdeburg supporters, Heinz Krügel began to be an itch that the state increasingly wanted to scratch. A slippery slope became even more dangerous when Magdeburg entertained West Germany’s Bayern Munich in the European Cup. The Stasi (State Security) had bugged the visitors’ dressing room, but when the tapes were offered to Krügel, he declined to take them. It was a move destined to reinforce the authorities’ views of a man increasingly perceived as a dangerous maverick. The fact that Magdeburg lost both legs to the Bavarian club wouldn’t have helped matters, but as Bayern went on to win the trophy, defeating Leeds United in the final, elimination to them was no more than should have been expected, and Magdeburg still went on to retain the East German title. For their manager though, the writing may well now have been on the wall in Berlin. It was just a matter of time. At the end of the following year, the East German FA decided it was appropriate to ban Heinz Krügel from all managerial duty, justifying the move by saying he had produced insufficient development of the Olympic athletes at 1. FC Magdeburg. The club had finished third in the league and it was deemed that Krügel’s shield of success, that had previously protected him, had now fallen sufficiently to offer an opportunity to scratch that itch. Doubtless under severe pressure, the club then sacked the most successful manager in the history of East German football. Given the scale of his success and the players he had produced for the national team, the justification for the action was so ironic that it almost sounded like they had picked something that no-one could believe was the real reason, just to display their ability to act as they saw fit. The team that won the European Cup Winners Cup against Milan back in 1974 perhaps best illustrates the folly of the authorities’ accusation. Not only were all of the players who took part in the final from within a radius of 30 miles of Magdeburg, but all were in their early to mid-twenties. It wasn’t only a successful team, it was a group of players that would doubtless improve and grow over time, with the benefit also flowing inevitably into the national team. If the reason for the dismissal was not as stated, and surely that has to be questionable at the very least, what was the real reason? Heinz Krügel was innovative and sought new ideas to develop his players, giving great play to dynamic skills and individual talents. His team of youngsters that defeated Milan were as technically proficient as their illustrious opponents, but in a regime where sporting success was measured in glory to the regime and support for the Communist Party, that hardly cut any mustard. A philosophy of encouraging skill and enabling it to flourish was as alien to the powers that be, as capitalism was. Heinz Krügel was demoted to become a maintenance manager at minor club, BSG Motor Mitte. It was a humiliation for the manager, somewhat akin to Sir Alex Ferguson being sacked from Manchester United at the height of his powers, and put in charge of a local leisure centre, but the club also suffered. They would not win another league title, never finishing higher than fourth; one place below Heinz Krügel’s placing with the club in his final season, when it was deemed appropriate to sack him. The whole episode was a tragedy not only for the club and its manager, but also for the fans of Magdeburg, who had been given a glimpse of the possibility of their club becoming a genuine force on the European stage. The event became one of the ‘Seven Tears’ that Magdeburg’s fans lament on in their songs. After the fall of the Berlin Wall, there was a move to honour the successes of Heinz Krügel, and the glories had brought to 1 FC Magdeburg, and he was given an award by the German football authorities. By now however he was retired and living in relative obscurity in a small village near Magdeburg. Fans launched moves to have the club’s stadium renamed in his honour, but the request was rebuffed. Instead, they raised money for a statue to their former manager, that now stands outside the stadium, showing him holding the Cup Winners Cup aloft. In his dotage, the old manager served in a number of honorary roles at the club. When he died in 2008 at the Magdeburger Universitätsklinik at the age of 87, 1. FC Magdeburg had fallen through the league structure and become a pale shade of the force they were on the brink of becoming during the Heinz Krügel years. It’s little wonder that memories of those days raise tears with the Der Club’s fans.